Anton Lipovetsky, Christine Quintana and Molly MacKinnon in the Delinquent Theatre production of Never The Last. Photo by Bold Rezolution Studio. 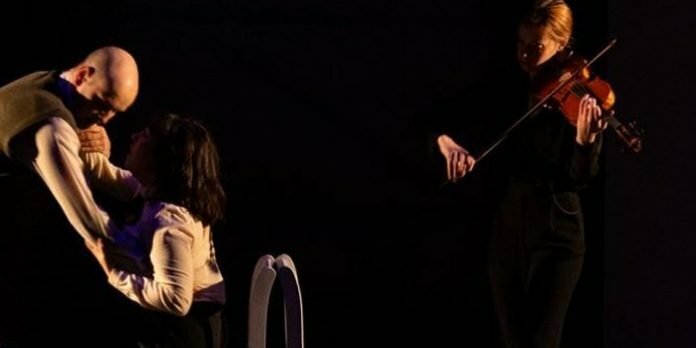 First seen as a workshop production at the 2016 rEvolver Theatre Festival, Vancouver playwright Christine Quintana and violinist Molly MacKinnon have reunited for the world premiere of Never The Last. All set to a score of Eckhardt-Gramatté’s own solo violin solos performed live on stage by MacKinnon, this multimedia presentation blends movement and text to tell a heartbreaking tale of adventure, poverty, and strife. 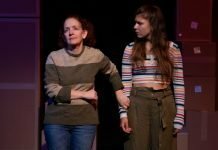 Vancouver Presents contributing editor Mark Robins was live at the Annex in downtown Vancouver with the company of Never The Last for a backstage tour and conversation with the cast. Never the Last plays Vancouver Civic Theatre’s Annex (823 Seymour St, Vancouver) as part of the SeeMore Theatre Series until April 20. Visit delinquenttheatre.com for tickets and information. We were LIVE in downtown Vancouver with the Delinquent Theatre company of Never The Last.Inspired by the life of composer Sophie-Carmen Eckhardt-Gramatté, Never The Last chronicles the ten-year love affair between the Russian-born, Canadian immigrant and German expressionist painter Walter Gramatté.Never the Last plays Vancouver Civic Theatre’s Annex (823 Seymour St, Vancouver) as part of the SeeMore Theatre Series on April 9–20. Visit https://delinquenttheatre.com/never-the-last/ for tickets and information.